If you're trying to stop a target fast, you need that magic effect that firearms experts call 'stopping power'. Speer's Law Enforcement Duty Ammunition brings that power to you. With its heavier hollow-point projectiles, these cartridges produce much more stopping power than their FMJ counterparts. They have proven time and again a worthwhile investment for a shooter who is at all concerned about being in a dangerous situation. 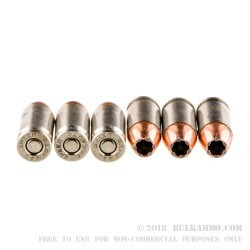 These .380 ACP JHP rounds by Speer LE produce 196 foot-pounds of muzzle energy, and travel out of the barrel at 990 feet per second (muzzle velocity). 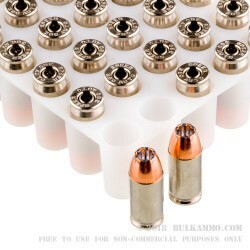 This 380 ammo comes packaged in a plastic tray of 50 cartridges, contained in a black Speer labeled card-stock box. When you order 380 auto ammo, you'll get a single box of Gold Dots delivered to your door or FFL. 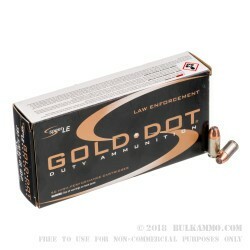 This ammo is frequently used as a concealed carry ammunition and the Gold Dot brand is one that's well-known and trusted throughout the world. great ammo for personal defence!! !